Set in the windswept village of Tofino on Vancouver Island's west coast, this book was the first in a series following reluctant coroner Elias McCann's investigations into mysterious deaths. Since then Zuehlke has completed two other Elias McCann novels: CARRY TIGER TO A MOUNTAIN (2002) and SWEEP LOTUS(2004), the latter of which was shortlisted for the Arthur Ellis Award for Best Novel. 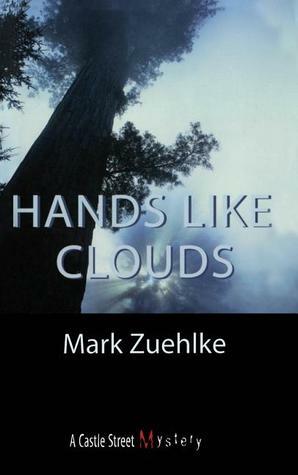 The publisher's blurb for HANDS LIKE CLOUDS states: "When environmental warrior Ira Connaught turns up hanging by the neck from an ancient rainforest cedar overlooking the wasteland of a clear-cut on Clayoquot Sound, everyone seems content to declare his death a suicide. The tree spiker won't be missed by loggers, Tofino's RCMP detachment, or by many environmentalists who applauded his goals but condemned his tactics. For reluctant community coroner Elias McCann, Ira's death looks increasingly like a murder. Elias is no forensic pathologist, no doctor. A quirk in BC law enables anyone of good community standing to be appointed local coroner. But RCMP Sergeant Gary Danchuk does not believe that Elias meets even the quirk in the law. Danchuk remains convinced - against all evidence - that McCann murdered his wife, Merriam, two years earlier in order to clear the way for his love affair with Vhanna Chan. Hands Like Clouds is the first in a series of mysteries revolving around the troubled life of Elias McCann, son of a remittance man and local coroner." I really enjoyed HANDS LIKE CLOUDS, and would be keen to read Zuehlke's other two books (if it was easier to get my hands on them down here in New Zealand). McCann is an interesting and original protagonist, and Zuehlke did a great job wrapping up a decent mystery in a very well-evoked setting. Even from my short experience of them, I knew British Columbia's Gulf Islands are places of rugged beauty and interesting characters, and Zuehlke captures this marvellously, along with the historic and contemporary tensions and clashes between the environmentalists and longtime industries like loggers. The quirky McCann (and his relationship with Vhanna Chan), along with some of Zuehlke's other characters, and the vivid setting, will stick with readers long after they finish the final page. Moreso than the mystery plot itself, which is a little-slow moving for fans of quick-paced writers like Simon Kernick, Gregg Hurwitz, Lee Child, and others. But this is more than compensated for by the rich characters and settings in HANDS LIKE CLOUDS. You are definitely transported to the Gulf Islands in the book - not only can you 'see' the natural environment, you can almost feel, hear, smell, and taste it as well. Something different for crime fiction fans, and an enjoyable read.